Shamiana Tents are Flat Roof, Indian ethnic Tent shelters. 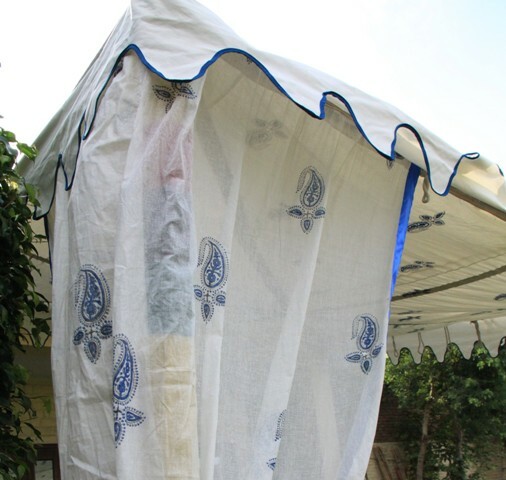 Traditionally these Tents have been used over the years in India, for outdoor parties, as Sun shades, for marriages, in restaurants and Hotels, etc. 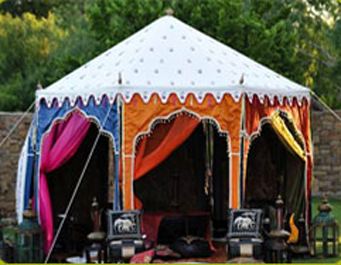 These Tents are generally erected on Bamboo poles or Metal poles with Base Plates, for hard Grounds. We also make other Wedding Tents. It is a flat roof Tent made up of two layers of cloth, Upper of cotton dosuti (Non – Water proof) with lining of multicolor patchwork cotton sheeting, Navrattan hand Patchwork, with four side frill of 15”. Or alternatively, the inner lining can be made up of Printed cotton sheeting. It is also made up of two layers, Outer of multicolor stripes and inner of same patchwork design as on the Shamiana. Or alternatively, prints can be used on the inside of the Shamiana tents. In one Shamiana you need 3 pcs kanats to cover three sides and one side shall remain open. The Shamiana Tents, come complete with all accessories, Selected Bamboo Poles with Pole covers or metal Poles, Ropes and carved Wooden Pegs.